Strong architectural subjects for the latest pastels. 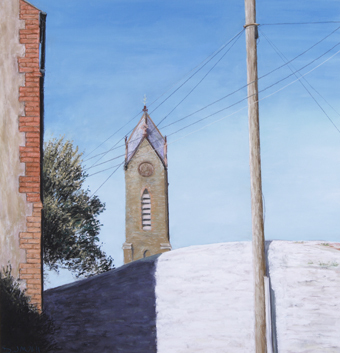 First up is “Market Place Tower, Peel”. A strong composition of light and shade, taughtly strung with a web of telephone wires, all to the backdrop of an intense blue sky zapping the white wash to the max! 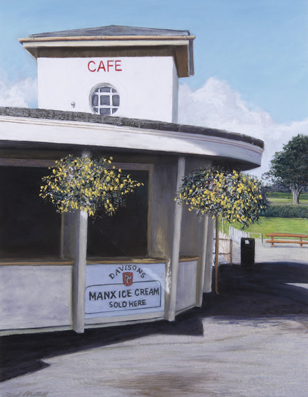 Next is the “Deco Cafe at Mooragh Park, Ramsey”. This star of a building is sited next to the boating lake. Strong early morning sunlight setting off the juxtaposed curve and straight / round and square dynamic of this Deco design. Pristine contrast again the order of the day. 15th of June to the 8th of July. Courtyard Gallery, Tynwald Mills, St Johns. The print is gently rolled to post in a tough, plastic capped postal tube, 4″ dia. To order please contact. You are currently browsing the David Maddrell weblog archives for June, 2007.